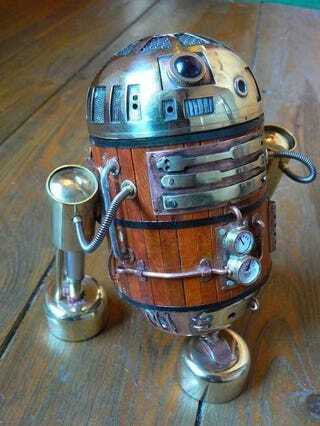 This Antique D2 project is a homemade, one-of-a-kind R2-D2, if R2 was made in an era when barrels were used as bodies for helper robots. Which is to say in an era that never existed, but I suppose that's what makes it fun, right? The detail on the model is really what makes this project stand out. It clearly had loads of work put into it, with the tiny valves on the front, pneumatic legs and grating on the top of the dome.